Veronica Roth has created a page-turning second novel in Insurgent, which continues the dystopian YA series set in futuristic Chicago. There, society is split into factions based on predominant character traits: Dauntless, Amity, Erudite, Candor and Abnegation. These exaggerated strengths have always helped maintain balance and morality among the whole. Until Erudite sought to overpower the others. In Divergent (book one), Erudite developed a serum that, once injected, can control groups of individuals. Using Dauntless as involuntary mercenaries, Erudite initiated their destructive plan. Insurgent continues the story of Tris and Four, two loyal Dauntless who are working to end the violence, but a faction no one considered is rising in the chaos: the factionless, those poor and misfit souls who failed initiation of their chosen faction. The factionless want to utterly destroy Erudite and do away with the old system completely. 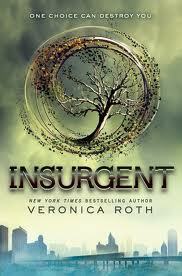 Can Tris and Four stop them even when a difference of opinion threatens to rip their relationship apart? Even when they become privy to information that could change everything—including known history? This was intense! I liked the first one just a bit more, but Ms. Roth does a tremendous job keeping the momentum moving through a sequel. I sympathize with Tris, but I don’t like her quite as much in this one, yet I admire her courage and still rally behind her. I missed the honesty and sweetness that so defined her relationship with Four. This time around, they bicker and hide things from each other constantly until I just wanted to shake them! Yet there’s still enough between them to hope they continue. And this book contains a tremendous element of suspense. What is the information the Abnegation leaders were going to make public, the information that started the war? It’s alluded to often, and Tris risks everything, including Four, to learn it. In the end, I thought the info was a little anticlimactic, but then I haven’t really taken the time to work out all the implications. I’ll leave that for Ms. Roth and simply anticipate book three! Previous Beneath the Slashings, by…Oh, look! It’s by me! Haven’t read this series. Enjoyed your revew. You are introducing me to MG books I didn’t know existed that have a taste of YA, but are age appropriate. You certainly read a lot. I try to average two kids books a week. I can usually get ahead in the summer, and I read many for homeschool too. MG is my first love, but I enjoy YA as well. This one’s definitely YA.